It’s officially Summer in the city and the FIFA World Cup is in full swing! Now, we know there are varying degrees of fans during the World Cup; there are people who have been born and raised watching “football” and others who just enjoy a bit of eye-candy. At FoodtoEat, we love all kinds of fans! As such, we’ve compiled a list of the best places to watch the World Cup – no matter what kind of fan you are. Hundreds of World Cup fans watching under the archway in DUMBO | Photo credit: @DUMBOBID on Twitter. On a huge screen with hundreds of fans, you can’t really go wrong with this free outdoor soccer celebration. Bring a blanket, some friends and enjoy the local food vendors under the archway on a huge projection screen. This Irish pub in Greenwich Village is where huge soccer/football fans come out and cheer for their teams. If you’re looking for a rowdy experience with people who live and breathe the sport, Mr. Dennehy’s is the place for you. “Where football is religion” is the motto of this bar and it definitely shows. This consistently packed bar has its share of soccer lovers and people who are just along for the World Cup ride. The energy at Nevada Smiths is always through the roof, so be prepared for a rowdy experience. This pub is the ultimate place to drink and watch soccer (but while you’re there, call it football!) with a slew of intense British fans that are obsessed with a bit of football. Enjoy traditional British food and drink great beer with some of the biggest supporters of the sport. Embrace the beautiful weather and head over the Rockefeller Center for some World Cup viewing. It’s the best of both words: 6 big screens for World Cup viewing and great lounging areas. Try out festive World Cup themed cuisine, great drinks and incredible views! Banter Bar in Williamsburg- They’re running a “World Cup Beer Passport” special. Try beers from 24+ of the World Cup countries and be entered to win discounts and prizes. Jack Demsey’s – Another bar for die hard fans, especially if you’re American. 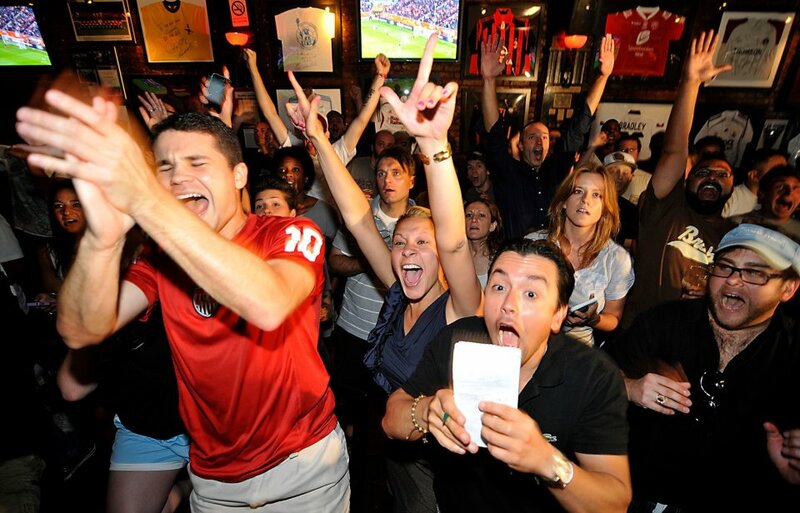 When the US beat against Ghana, people rallied outside to celebrate. Woodwork Brooklyn – Where soccer-obsessed Brooklynites celebrate. They’ve dedicated their entire website to the World Cup. If screaming at your television and drinking beer isn’t quite your thing, maybe looking at the gorgeous men on the field is! Check out our FoodtoEat Original Quiz! Next Entry:So, How Exactly Does Social Ordering Work?